A video published by the Israeli Defense Forces showing a Palestinian medic acknowledging that she was acting as a “human shield” is said to be a haphazardly edited fake made to justify her death. On June 1, an Israeli sniper killed Razan al-Najjar, an unarmed Palestinian paramedic who helped wounded protesters during the weeks-long March of Return demonstrations along the fence separating Gaza and Israel. Following the incident, a number of Israeli government and army officials — including the IDF's official Twitter account — posted a series of tweets saying that Gaza's Hamas movement used Razan and others as "human shields" for protesters. All tweets included a video in which Razan gives an interview and identifies herself. It then cuts to her saying "I am a human shield" in Arabic. "I am Razan al-Najjar. I am here on the frontlines and I act as a human shield," the English subtitles read. — IDF (@IDFSpokesperson) 7 июня 2018 г. ​"This medic incited by Hamas to give up her life for their goals," the video captions said. "Razan al-Najjar is not the angel of mercy that Hamas propaganda attempts to portray," the IDF's Arabic language spokesperson Avichay Adraee wrote on Twitter. 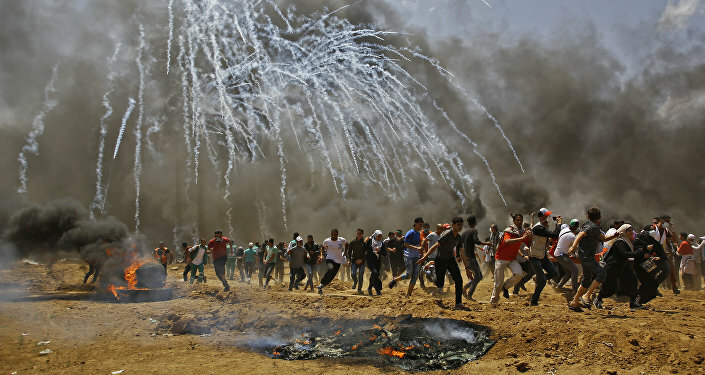 "Her admission that she is a ‘human shield' for the inciting rioters proves how Hamas uses the entire Gaza population as ammunition for its aims and for Iran's aims," he added. While it is obvious that the IDF's version of the interview is cut short, the longer clip has become available on Al Mayadeen News Youtube channel. On the longer cut, the medic's words, translated by The Independent, are, "I am Razan al-Najjar. I am here on the frontlines and I act as a rescuing human shield to protect and save the wounded at the frontlines." Many on the internet are now calling the IDF's video into doubt. The Independent credits Israeli-American writer Mairav Zonszein with specifically articulating the accusation. "The IDF always accuses Palestinians and Israeli human rights orgs of editing documentation of its human rights abuses. But it edited this video of Razan al-Najjar to discredit her after murdering her. Absolutely despicable and hypocritical," he wrote in his Twitter account. — Mairav Zonszein (@MairavZ) 7 июня 2018 г. ​The IDF has not yet responded to the accusations.